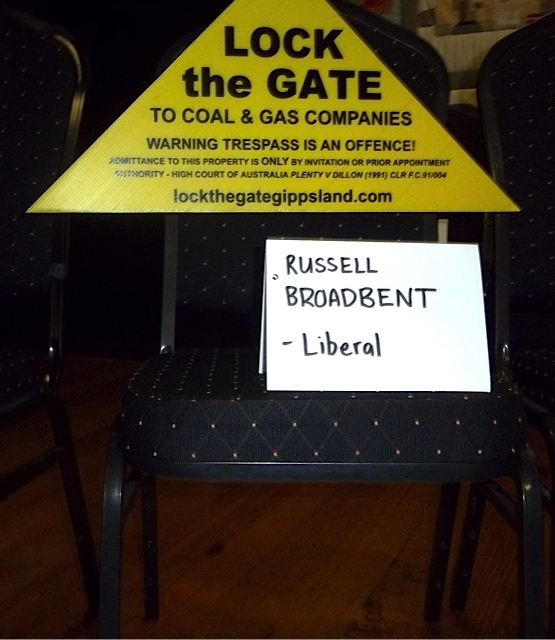 In an act that reeks of both arrogance and complacency, Russell Broadbent, the Federal Member of Parliament for the electorate of McMillan in South Gippsland, failed to show up at a forum on coal and unconventional mining held in Yarragon last week. Marg Thomas, a member of Coal and CSG Free Mirboo North, reports on the marked absence of the incumbent MP. Last week, the Baw Baw Sustainability Network and Lock the Gate Victoria convened a community forum, providing candidates for the seat of McMillan with an opportunity to present their views on and discuss the issue of new coal and CSG mining in the region. While he was invited to attend, along with all other available candidates, Mr Broadbent’s failure to turn up was not only surprising, given he currently holds the seat, but disappointing for his constituents. This was an opportunity for the community to raise their concerns with their MP on new coal and CSG mining. It is hard to believe that Mr Broadbent is taking his role seriously when he refuses to engage with the community on this critical and fraught issue. The people of McMillan wanted to hear the policies of all the candidates for the seat in regard to mining, as it is an issue that affects everyone. In failing to show up, the Liberals gave those at the forum a sense that they had been snubbed, or that they think that the election result is ‘in the bag’. All other candidates were in attendance and welcomed the opportunity to present their policies. When approached on the issue of CSG mining in the past, Mr Broadbent has consistently stated that, ‘it is a state issue’. However, there is a history of convergence between state and federal governments on unconventional mining. This interaction between the levels of government is borne out by the recently released National Harmonised Regulatory Framework for Natural Gas from Coal Seams, commissioned by the Federal Government from the Standing Council on Energy and Resources (SCER). The states handed the responsibility for this report to the Federal Government following significant pressure from communities across Australia to set more stringent regulations on gas mining companies. The report was also prompted by heated discussion around the expectation that land holders would ‘co-exist’ with miners under a ‘Shared Land Use’ policy. Coal and CSG Free Mirboo North (formerly Friends of Gippsland Mirboo North) submitted a comprehensive 92 page submission to the SCER, which was subsequently considered by the Council of Australian Governments (COAG) in April 2013. The document was then signed off by the states and released in May 2013. It would seem, then, that any federal politician who hides behind the mantra that ‘this is a state issue’ is, in fact, afraid to face the hard questions on the future of new coal and unconventional gas mining on our land or question the viability of ‘shared land use’ for farmers, given the environmental damage that has been shown to be the result of all forms of fracking, both here and internationally. 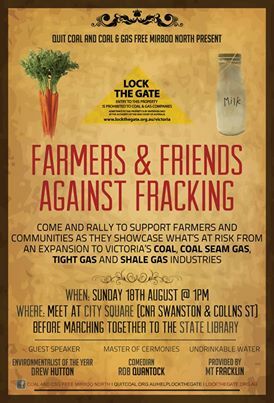 Recently, an unprecedented event – the ‘Farmers & Friends Against Fracking’ rally on August 18th – saw farmers and townspeople from all over Gippsland marching along Swanston Street in Melbourne, bringing their message on fracking to the State Government and the people of Melbourne. Farmers of all kinds, from the large potato growers industry to organic farmers, to vegetable growers and dairy and beef farmers, held their banners high and told the State Government that they do not want to share their land with mining companies, threatening their fertile farmlands and precious water supply. Mr Broadbent should take his constituents more seriously, and show them that he respects his elected position by answering community concerns on the proposal for new coal and CSG mining across McMillan. The people and farmers of Gippsland view mining, and in particular fracking, as a threat to their livelihoods and to the health of their communities and the environment. Gippsland wants clarity on the Liberal policies on new coal and gas mining and the chance to have a serious consultation with the region’s federal representative before going to the polls on Saturday. Time, it would appear, is running out for Mr Broadbent, and perhaps he will come to regret his decision to snub those he is supposed to represent. For more information on fracking’s threat to the Australian environment and people, have a look at Blink, and we’ll all be fracked.